Sunday was supposed to be the day the two sides came together. Turns out, the impasse lives. NEW YORK (CNNMoney) -- The day started with congressional leaders trying to resolve the dangerous impasse over the debt ceiling -- and calm any anxiety markets may have when they reopened Monday. It ended in a continuing impasse, with each party sketching out their own plans and showing little common ground. Senate Majority Leader Harry Reid said he is preparing a proposal to raise the ceiling through the end of 2012 and cut $2.7 trillion in debt. The measure would not call for any tax revenue increases. On the other side, House Speaker John Boehner told GOP lawmakers Sunday in a conference call that he wants a deal that sticks to the principles of the Cut, Cap and Balance bill that the House passed and Senate rejected last week, sources familiar with the call told CNN. A key sticking point remains how much to raise the debt ceiling: Democrats want it raised enough so the issue won't come up again until after the November 2012 election. Boehner has said that is impossible; he wants it raised in two, smaller increments. It remains to be seen if the two sides can resolve their conflicts soon. If Congress fails to act, the Treasury Department has said that on Aug. 2 it will run out of the cash it needs to pay all of the federal government's bills on time. Meanwhile, the stakes are getting higher every day. "It's taken us seven months to get to the place where we are now," Geithner said on CNN's State of the Union. "We're almost out of runway." Credit rating at risk: All three major credit rating agencies have warned in the past week that they are considering a downgrade of the nation's debt. To date, the United States has enjoyed its AAA rating in part for having always stood behind its debt and paid its bills on time. As a result, U.S. Treasury bonds are considered the world's safe-haven investment. If the U.S. were to lose its AAA status, foreign investors, who hold about half of all U.S. Treasuries, might demand higher interest rates in exchange for holding the debt. And for at least two of the rating agencies -- Moody's and S&P -- raising the debt ceiling is not enough. They also want to see lawmakers agree to substantial debt reduction. Standard & Poor's has already said there is a 50-50 chance it would downgrade the United States within 90 days. If Congress fails to act in time: Experts warn that a failure to raise the debt ceiling in time would -- if not immediately, then soon enough -- send shockwaves through the underpinnings of the financial system that could ripple out to individual investors and consumers. The federal government would be forced to prioritize its payments. It would risk defaulting on its financial obligations. "Even if Washington did raise the debt ceiling after just a few harrowing days following a default ... we envisage that the economy could fall quickly back into recession," Standard & Poor's said last week. Federal Reserve Chairman Ben Bernanke has said the fallout could be "catastrophic" and "self defeating." Market reaction a scary unknown: No one knows exactly how the markets would react. 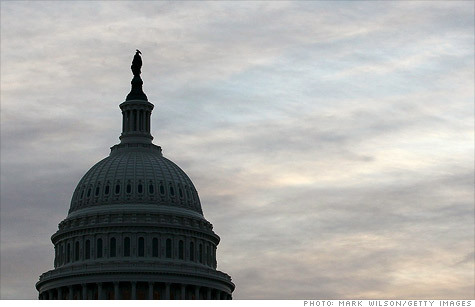 Some bond experts expect that Treasury rates won't rise but stocks may tank. In other words, investors will move out of risk-based assets and into the safety of bonds. So interest rates may stay low, but Americans' investments may get whacked. Or, Treasury yields could become volatile and start to climb as investors lose faith that lawmakers have the political will to be fiscally responsible. That would push the cost of U.S. debt higher. And it could cause rates on consumer loans -- like mortgages and car loans -- to climb higher as well. Broader ripple effect: If the debt ceiling isn't raised, the federal government won't be able to pay 44% of its bills worth an estimated $134 billion due in August, according to a Bipartisan Policy Center analysis. And Treasury won't be allowed to borrow new money to make up for the gap between revenue and spending. Technically, it wouldn't be a "cut" in spending so much as a postponement. That's because the bills Treasury puts off will have to be paid once the debt ceiling is raised. But if government spending were to suddenly dry up even for a short while, it could send a ripple through the economy and slow growth. --CNN's Ted Barrett and Kate Bolduan contributed to this report.